This data set provides the results of (1) the physical and chemical characterization of streams and (2) comparable chemical analyses of extracted soil water in the Aldeia River basin at Fazenda Nova Vida, a large cattle ranch 50 km from the city of Ariquemes, in central Rondonia, Brazil, from 1994-2001. Data are provided on the stream beds including cross-sectional depth and stream bed surface type. Stream discharge is reported. Streamwater was sampled and analyzed periodically over the eight-year duration of the study at numerous steam locations. Soil solution samples were collected at the same frequency with lysimeters placed at 30 cm and 100 cm depths on the floodplain and at upland forest and pasture sites in the Aldeia River watershed. There are five comma-delimited data files in this data set. Figure 1. 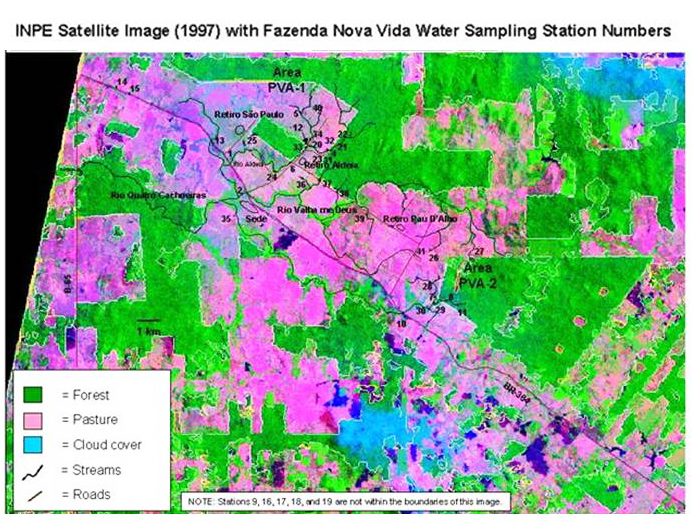 Fazenda Nova Vida study areas PVA-1 and PVA-2 and water sampling stations displayed on an INPE satellite image (1997). Figure 2. Fazenda Nova Vida study area PVA-1 and lysimeter sampling stations displayed on an INPE satellite image (1997). The investigators were Deegan, Linda A.; Krusche, Alex V.; Neill, Christopher; Thomas, Suzanne M.; Victoria, Reynaldo Luiz and Haupert, Christie Lynn. You may contact Deegan, Linda A. (ldeegan@mbl.edu) and Haupert, Christie Lynn (chaupert@mbl.edu). This data set provides the results of (1) the physical and chemical characterization of streams and (2) comparable chemical analyses of extracted soil water in the Aldeia River basin at Fazenda Nova Vida, a large cattle ranch 50 km from the city of Ariquemes, in central Rondonia, Brazil, from 1994-2001. Data are provided on the stream beds including cross-sectional depth and stream bed surface type. Stream discharge is reported. Streamwater was sampled and analyzed periodically over the eight year duration of the study at numerous steam locations. Soil solution samples were collected at the same frequency with lysimeters placed at 30 cm and 100 cm depths on the floodplain and at upland forest and pasture sites in the Aldeia River watershed. Stream physical characteristics were measured in a one-time synoptic survey during the dry seasons, June-August, of 1998 and 1999. 1 Trip_ID Trip identification code with values A,B,C...N.
4 Month mm Month when samples were collected in the field with 1 = January, 2 = February, etc. 6 Season Season of the year when sample was taken: Wet or Dry. Rainy season is typically from November to April. 8 Station_ID Sampling station identification number. See associated documentation for a map of the sampling area (stations 1-41). Table 1. Streamwater sampling station descriptions including Study Area. See Figure 1 for locations. 5 PVA1 Pasture stream. 1 km upstream of forest reserve. Old PVA1 pasture sampling location. 14 Unnamed stream where it crosses BR-364 just south of intersection with B-65. 31 PVA1 edge. 50m from forest edge. 32 PVA1 edge. Very near Station 32. 34 Upstream of Sta. 12 in PVA1 pasture stream. Where we have done nutrient additions upstream of bridge. 35 Rio Quatro Cachoeiras behind house. Just off road. Easily accessible. Sampling point just after bridge over Rio QC. 36 1st order pasture stream in area where soils manipulations will occur. 37 1st order forest stream that crosses Aldeia-Pau D'Alho road and joins the Rio Valha me Deus. 38 1st order forest stream that crosses Aldeia-Pau D'Alho road and joins the Rio Valha me Deus. 39 1st order pasture stream that joins the Rio Valha me Deus. 40 1st order pasture stream that joins the PVA1 pasture stream. 41 1st order pasture stream that joins the Rio Valha me Deus (crosses main road into Retiro Pau D'Alho from BR-364). These data allow for direct comparisons of stream and soil water nutrient concentrations and other physiochemical characteristics between pasture and forest land uses and across wet and dry seasons. Sampling was done on streams of various orders allowing investigators to better understand the impacts of land use on stream nutrient dynamics at various scales. All data have been reviewed and checked for quality and no further changes to the data are anticipated. The data were collected from the Aldeia river network at Fazenda Nova Vida, a large cattle ranch 50 km from the city of Ariquemes, in central Rondonia. The climate of central Rondonia is humid tropical. Mean annual relative humidity is 89 percent, mean daily temperature is 25.6 degrees C, and mean daily temperature for the warmest and coolest months varies <5 degrees C (Bastos and Diniz, 1982). Rainfall averages 2.2 m/yr with a distinct dry season during June-October and a rainy season stretching from November-May. Rainfall averages more than 300 mm per month in the wettest four months (December-March) and less than 40 mm per month during the driest three months (June-August) (Bastos and Diniz, 1982). The river network consists of first to fourth order streams in a mix of forest and pasture. Terrain was gently rolling, with low-gradient, second-order, clear-water streams draining the basins. Streams of second-order and higher had flowing water through all but the severest dry periods. Forest in the cleared basins was converted directly to pasture by cutting, burning, and planting pasture grasses in the same year. Brush was cut in March, large trees were felled in June or July, slash was burned in late August or September, and the pasture grass Brachiara brizantha [Hochst] Stapf was seeded during December or January. Pastures were not cultivated, nor were they amended with fertilizer or lime. Pastures were actively grazed beginning approximately one year after forest clearing and stocked throughout this study at 1-1.5 animals/ha. Pasture stream channels were bordered by uplands planted to B. brizantha and had only scattered trees in the riparian zone. Pasture stream channels typically contained wetland grasses (Paspallum spp. ), which sometimes form floating mats that covered most of the stream channel. In two watersheds (referred to as PVA1 and PVA2), two smaller (2nd order) drainage basins, one with forest cover and one with pasture cover, were identified and paired: PVA1-Forest4 with PVA1-Pasture12 and PVA2-Forest8 with PVA2-Pasture7. PVA1, a third-order stream (PVA1-Pasture 25) that was the confluence of the second-order forest and pasture streams, was also intensively studied. In PVA1, the second-order forest stream had a watershed area of 17.8 km2. It was shaded, had a pool and run structure and a mean wetted width of 4 m, a maximum depth of 42 cm and dry season discharges of 15-40 L s-1. The PVA1 second-order pasture stream had a watershed area of 8.4 km2. It was bordered by the C4 grass Paspalum repens (Medina et al., 1976) along its entire length, had slow-moving deep runs with extensive channel infilling by grass, organic material, a mean wetted channel width of 5.2 m, an open water channel width of 1.4 m and a mean depth of 42 cm. It had dry season discharges from 14 to 90 L s-1. The PVA1 third-order pasture stream had a watershed area of 27 km2. It had high sandy banks, a pool and run structure and lacked extensive growth of grass in the stream channel. Although this stream had some riparian trees, the canopy was relatively open and most of the stream was exposed to the sun. It had a wetted channel width of 3.6 m, a nearly identical open water channel width of 3.5 m and a mean depth of 34 cm. It had dry season discharges of 45 to 100 L s-1. These basins lie at 200-500 m elevation in a region generally underlain by Precambrian granitic rock (Projeto RADAMBRASIL, 1978). In PVA 1, stream physical characteristics were measured in a one-time synoptic survey during the dry seasons, June-August, of 1998 and 1999 in representative reaches of 800 m (forest stream; PVA1-Forest4), 500 m (second-order pasture stream; PVA1-Pasture12) and 760 m (third-order pasture stream; PVA1-Pasture25) that had no obvious tributaries or other obvious surface water inputs. The second- and third-order streams were marked at 20 m intervals and sampling stations were assigned, relative to the location at 0 m, at -260, 40, 60, 100, 140, 200, 320, 560, and 800 m for the second-order forest stream, -90, 30, 50, 80, 126, 232, and 500 m for the second-order pasture stream, and at -90, 40, 60, 100, 195, 460, and 760 m for the third-order pasture stream. Stream depth and benthic substrate type were recorded every 5 or 10 cm in cross sections (20 to 80 points per cross section) of the stream channels. •Substrate type was classified as: terrestrial leaf pack (Leaf), woody debris (downfall trucks and stems; Wood), thin layer of fine organic matter over sand (Fine), exposed sand (sand), clay (clay) or gravel (gravel), coarse fragments of decomposed organic matter (detritus), and riparian grass (riparian). Very small patches of filamentous algae were observed but their area (< 0.01% of stream bottom) did not warrant a separate quantitative habitat classification. In the forest, cross sections were done every 10 m, at the designated stations and 5 m and 10 m upstream and downstream of the station (N= 75 cross sections). In the pasture streams, cross sections were at 10 m intervals from the 0 m station to the 100 m station, every 20 m between the 100 m and 200 m stations, and every 40 m downstream of the 200 m station. Additional cross sections were measured at the designated stations and 5 m and 10 m up and downstream of the designated stations (N=45 cross sections in second-order and 39 in third-order pasture streams). Percent cover by substrate type for each cross section was the total number of occurrences of each substrate type divided by the total number of occurrences of all substrate types. Mean percent cover for the stream reach of each substrate type was determined by averaging the percent for each cross section. Stream discharge is calculated from measurements of stream flow rate (measured with a propeller flow probe) and stream depth (Hauer and Lamberti, 1996). Between 1994 and 2001 at each station the following samples were collected and analyzed as described. Dissolved inorganic nitrogen to phosphorus ratios (DIN:DIP) was calculated as (nitrate + ammonium)/phosphate. Dissolved organic nitrogen and phosphorus (DON and DOP) were calculated from the difference between TDN and TDP and inorganic N and P, respectively. At each streamwater sampling location, in a 1L Nalgene bottle, collect a streamwater sample by first rinsing the bottle with streamwater three times and then filling, avoiding surface material and other ‘floaters’. Field- From the 1L Nalgene bottle, pour a subsample into a rinsed cup from which approximately 20 mL is extracted with a 60 mL syringe. This volume of water is used to rinse the syringe. Draw streamwater into the syringe and filter the sample through a filter holder loaded with a 25 mm diameter ashed GFF filter. The first 10 mL is passed through the filter to remove any impurities on the holder or filter. Another 10 mL or so is used to rinse the clean, acid-washed 60 mL bottle. Then filter 50 mL into the rinsed bottle. Add 1 mL of 6N HCl. Cap, shake, and store in a cooler until the sample can be refrigerated. Laboratory- Using the phenol-hypochlorite method (Alpkem Corporation, Method No. A303-S020-02), samples were run using an Alpkem colorimetric autoanalyzer. Field- From the 1L Nalgene bottle, pour a subsample into a rinsed cup from which approximately 20 mL is extracted with a 60 mL syringe. This volume of water is used to rinse the syringe. Draw streamwater into the syringe and filter the sample through a filter holder loaded with a 25 mm diameter ashed GFF filter. The first 10 mL is passed through the filter to remove any impurities on the holder or filter. Another 10 mL or so is used to rinse the clean, 60 mL acid-washed bottle. Then filter 50 mL into the rinsed bottle. Add 1 mL of 6N HCl to the bottle. Cap, shake, and store in a cooler until the sample can be refrigerated. Laboratory- Using the cadmium reduction method (Alpkem Corporation, Method No. A303-S171-09), samples were run using an Alpkem colorimetric autoanalyzer. Laboratory- Using the antimony/molybdate and ascorbic acid method (Alpkem Corporation, Method No. A303-S200-00), samples were run using an Alpkem colorimetric autoanalyzer. From the 1L Nalgene bottle, pour a subsample into a rinsed cup from which approximately 20 mL is extracted with a 60 mL syringe. This volume of water is used to rinse the syringe. Draw streamwater into the syringe and filter the sample through a filter holder loaded with a 25 mm diameter ashed GFF filter. The first 10 mL is passed through the filter to remove any impurities on the holder or filter. Another 10 mL or so is used to rinse the clean, acid-washed 60 mL bottle. Then filter 50 mL into the rinsed bottle. Add 1 mL of 6N HCl to the bottle. Cap, shake, and store in a cooler until the sample can be refrigerated. Laboratory- Using an air/acetylene flame, read cation absorptions using a flame spectrometer. Field- From the 1L Nalgene bottle, pour a subsample into a rinsed cup from which approximately 20 mL is extracted with a 60 mL syringe. This volume of water is used to rinse the syringe. Draw streamwater into the syringe and filter the sample through a filter holder loaded with a 25 mm diameter ashed GFF filter. The first 10 mL is passed through the filter to remove any impurities on the holder or filter. Another 10 mL or so is used to rinse the clean, 60 mL acid-washed bottle. Then filter 50 mL into the rinsed bottle. Store in a cooler until the sample can be frozen. Laboratory- Using an alkaline persulfate matrix, digest sample (method 4500-Norg Dc) and analyze for nitrate. Laboratory- Using an acidic persulfate matrix, digest sample (Koroleff 1983) and analyze for phosphate. Laboratory- Extract chlorophyll from filter with 95% buffered acetone overnight (Strickland and Parsonse) and analyze the extract the following day using a fluorometer. Final extract concentrations should take into account background matrix and phaophytin fluorescence. NOTE: These following steps are done in the lab with 1L of unfiltered streamwater collected and kept in a cooler for transport to the laboratory. Field- In a 1L Nalgene bottle, collect a streamwater sample by first rinsing the bottle with streamwater three times and then filling the bottle to the top (without bubbles), avoiding surface material and other ‘floaters’. Place bottle in a dark cooler with ice until return to the laboratory. Field Laboratory- The cooled sample is allowed to return to room temperature. pH is measured with a calibrated pH probe and then the sample is titrated to pH 4.5 and pH 4.2 using a Hach titrator with 0.16N H2SO4. Alkalinity is calculated using the equation (2A-B) * 0.1= Alkalinity, where A is the number of titration units to pH 4.5 and B is the number of titration units to pH 4.2 (this includes the previous titration units as well). Field- In a 1L Nalgene bottle, collect a streamwater sample by first rinsing the bottle with streamwater three times and then filling the bottle, avoiding surface material and other ‘floaters’. Place bottle in a dark cooler with ice until return to the field laboratory. Field Laboratory- Using a vacuum filtration setup, filter streamwater through a weighed (to 4 places) and ashed 25 mm diameter GFF filter. Pass as much water as possible through the filter until it clogs. Record the volume of filtrate and the weight of the filter. Air dry the filter. After the sample is returned to the lab, dry at 50ºC for 24 hours and reweigh filter to 4 places. Field- In a 1L Nalgene bottle, collect a streamwater sample by first rinsing the bottle with streamwater three times and then filling the bottle, avoiding surface material and other ‘floaters’. Place bottle in a dark cooler with ice until return to the field laboratory. Field Laboratory- Follow the instructions for filtering the Total Suspended Solids sample (presently, a double vacuum setup is being used, with the vacuum being produced by a peristaltic pump), with the exception that this GFF filter does NOT need to be weighed. Dry the filter as above. Back at the lab, the filter can be dried (as above) and packaged for analysis on a carbon/nitrogen analyzer. Laboratory- Pack the dried filter in an aluminum circle wrap (follow machine-specific directions). Run the samples in a carbon-nitrogen detector to determine carbon and nitrogen concentrations. Soil solution was collected from tension lysimeters (Soil Moisture Equipment, Goleta, California, USA) installed in 30 cm and 100 cm pairs at each site in September 1996 as shown in Figure 2. Lysimeters should be vacuum-pumped 24 to 48 hours before the anticipated collection (vacuum pressure to be used: 45 psi). Remove any standing water in the lysimeter and check the clamps, tubing, and cap for signs of wear and damage. Remove the lysimeter cap and insert the glass rod connected to the suction assembly. If the lysimeter has water, suction a small amount into the collection bottle and rinse. Suction the remaining water from the lysimeter into the collection bottle. Transfer the contents of the collection bottle to the two 50 mL sample bottles. First collect for nutrients, cations, and TDP and if there is sample remaining, collect for TDN and anions. Rinse the suction assembly with DI to prepare for the next lysimeter. Back at the truck, preserve the nutrient/cation sample with 6N HCl in the same amount as the regular water samples (e.g., for a 50 mL sample, use 1 mL of 6N HCl). This sample gets refrigerated. The TDN/TDP sample treated the same as regular water sample TDN/TDP’s- frozen. Field- Collect as described above and preserve with HCl (Add 1 mL of 6N HCl for 50 mL). Cap, shake, and store in a cooler until the sample can be refrigerated. Field- Collect as described above and preserve with HCl (Add 1mL of 6N HCl for 50 mL).Cap, shake, and store in a cooler until the sample can be refrigerated. Field- Collect as described above but do not preserve. Store in a cooler until the sample can be frozen. Field- Collect as described above and preserve with HCl (Add 1mL of 6N HCl for 50 mL). Cap, shake, and store in a cooler until the sample can be refrigerated. Alpkem Corporation. RFA Methodology Handbook. 1987. College Station, Texas. Bastos, T.X. and T.D. Diniz. 1982. Avaliacao de clima do Estados de Rondonia para Desenvolvimento Agricola. Boletim de pesquisa No. 44. EMBRAPA-CPATU: Belem PA.
Eaton, A.D., L.S. Clesceri and A.E. Greenberg. 1995. Standard Methods for the Examination of Water and Wastewater. 19th edn. American Public Health Association, Washington, DC, USA. Garcia-Montiel, D., C. Neill, J.M. Melillo, S.M. Thomas, P.A.Steudler and C.C. Cerri. 2000. Soil phosphorus transformations after forest clearing for pasture in the Brazilian Amazon. Soil Science Society of America Journal 64: 1792-1804. Hauer, F.R. and G.A. Lamberti. 1996. Methods in Stream Ecology. Academic Press, New York. Koroleff. F. 1983. Determination of total phosphorus by acid persulfate oxidation. Pages 134-136in K. Grasshoff, M. Erhardt and K. Kremling, editors. Methods of seawater analysis. Verlag Chemie, Weinheim Germany. Moraes, J., C.C. Cerri, J.M. Melillo, D. Kicklighter, C. Neill, D.L. Skole and P.A. Steudler. 1995. Soil carbon stocks of the Brazilian Amazon Basin. Soil Science Society of America Journal. 59: 244-247. Moraes, J.F.L., B. Volkoff, M. Bernoux and C. Cerri. 1996. 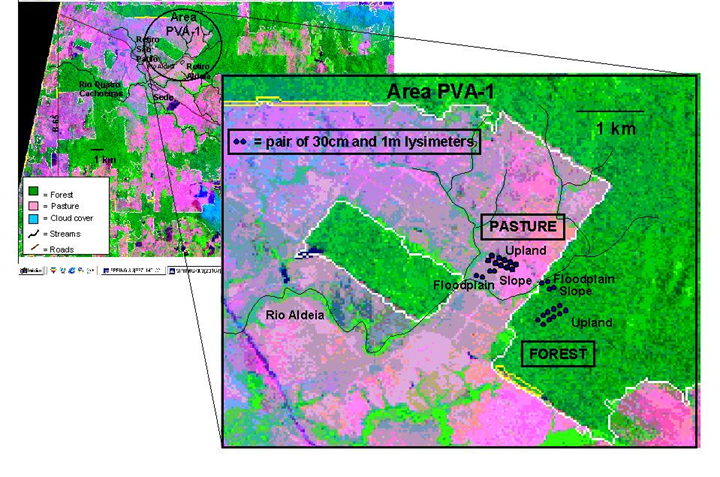 Soil properties under Amazon forest and changes due to pasture installation in Rondonia (Brazil). Geoderma 70: 63-81. Neill, C., M.C. Piccolo, P.A. Steudler, J.M. Melillo, .J. Feigl and C.C. Cerri. 1995. Nitrogen dynamics in soils of forests and active pastures in the western Brazilian Amazon Basin. Soil Biology and Biochemistry 27: 1167-1175. Perkin Elmer Corporation. Atomic Absorption Spectrophotometry. 1982. Norwalk, Connecticut. Pires, J.M. and G.T. Prance. 1986. The vegetation types of the Brazilian Amazon. In Key Environments: Amazonia. Prance GT and Lovejoy TM (eds). Pergamon Press: Oxford; 109-129. Strickland, J.D.H. and T.R. Parsons. 1972. A Practical Handbook of Seawater Analysis. Fisheries Research Board of Canada. Ottawa. Thomas S.M., Neill C., Deegan L.A., Krusche A.V., Ballester V.M., Victoria R.L. 2004. Influences of land use and stream size on particulate and dissolved materials in a small Amazonian stream network. Biogeochemistry 68: 135-151. Neill, C., L.A. Deegan, S.M. Thomas, and C.C. Cerri. 2001. Deforestation for pasture alters nitrogen and phosphorus in small Amazonian Streams. Ecological Applications 11(6):1817-1828. Richey, J.E., A.V. Krusche, L.A. Deegan, V.M. Ballester, T.W. Biggs, and R. Victoria. 2001. Land use changes and the biogeochemistry of river corridors in the Amazon. IGBP Global Change Newsletter 45:19-22. Neill, C., L.A. Deegan, S.M. Thomas, C.L. Haupert, A.V. Krusche, V.M. Ballester, and R.L. Victoria. 2006. Deforestation alters the hydraulic and biogeochemical characteristics of small lowland Amazonian streams. Hydrological Processes 20(12):2563-2580.